The G20 meeting in Buenos Aires was a historic event, not for the summit itself, but for the dinner meeting between Donald Trump and Xi Jinping. The two leaders met in order to solve the trade wars between the US and China that has unsettled markets in the past months. Whilst there were no firm agreements in place following the talks, the warm negotiations were a much needed shot it the arm for the global economy and on Monday morning, the markets reacted. The Hang Seng was the first index to react to the news and finished trading +2.55% at 27,182. The European markets followed suit as they opened on Monday morning. The DAX, which has been most sensitive to the trade wars, is up 2.46%, with the FTSE, MIB, CAC and IBEX all in green. One of the commodities that saw a surge following the news was oil. After enduring one of its worst months in recent times, Light Sweet Crude Oil Futures were as much as 5% up as trading began. As well as benefiting from the trade talks, the oil market also woke up to the news that Qatar is set to leave the OPEC organization in January following a 57 year membership. Qatar is the largest producer of liquefied natural gas and is withdrawing from OPEC to enhance its role internationally and to focus on the gas industry. The UK mining sector is also strongly benefiting from the nascent relationship as much of the talks include materials and resources. 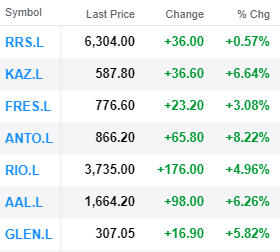 Firms including Antofagasta, KAZ Minerals and Anglo American have been up between 6 and 8% in early trading. Stability in the markets has also trickled through to the UK banks on Monday morning. Standard Chartered was up as much as 4% and HSBC over 2.5%, both of which have strong ties to the Asian market which was buoyed by the news. Barclays and RBS were up over 2% on the UK front. Geopolitical news often has strong effects on the global marketplace and if you would like further analysis of the news or to find out about upcoming events that could be a factor, call one of our brokers directly on 0121 454 0770.